--> A FULL SET OF BFGoodrich Tires!!! WHAT!?!?!? --> A $800 Fuel Tank from Titan Fuel Tanks!!!! --> Ladies Offroad Network backpack with TOOLS! THANK YOU to all those that support the Ladies!! 3 Days until the 2018 Ladies Offroad Convention kicks off!! The U-Haul is loaded and I'm on the road to Salt Lake City! Why a Uhaul? Because I have TONS OF GIFTS compliments of some amazing companies that believe in YOU!! 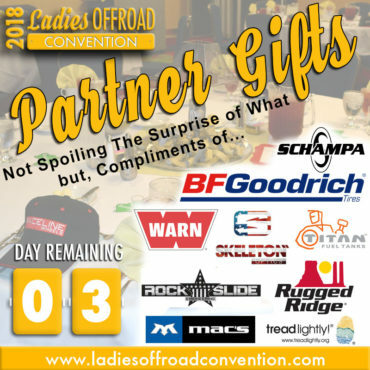 4 Days until the 2018 Ladies Offroad Convention kicks off!! 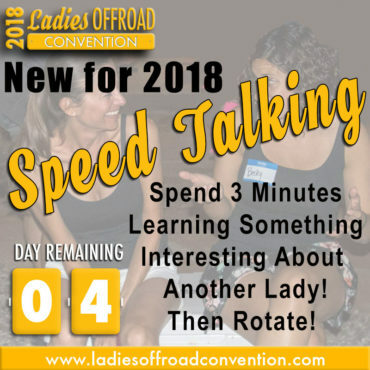 We added a NEW ACTIVITY for 2018 - Speed Talking!! Yes, I bet we could battle for who is best at this normally 🙂 There will be some flexible time where we will have an area set up to speed talk with ladies and find out something interesting about them. 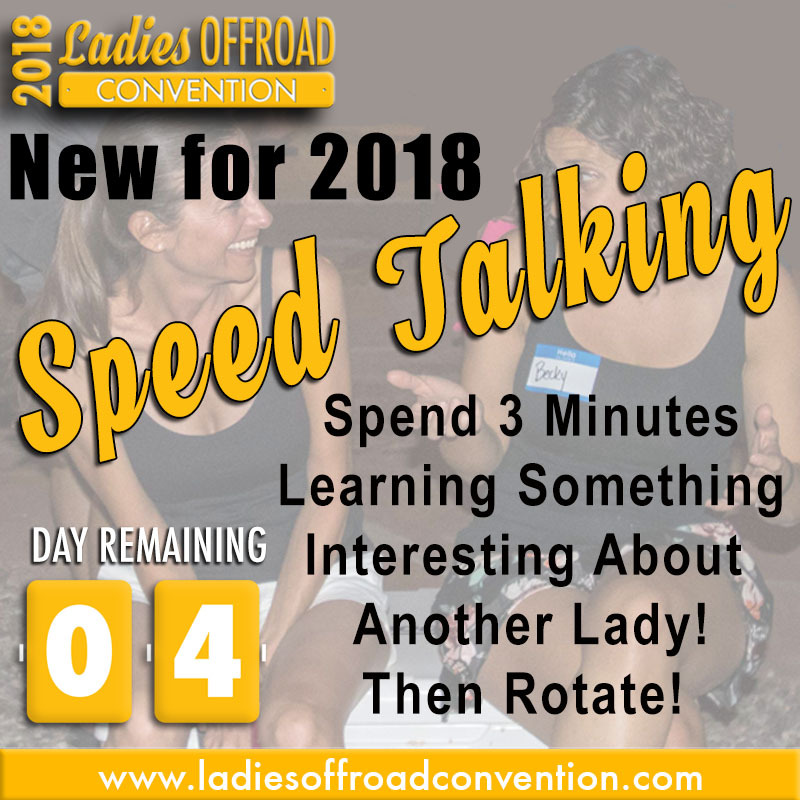 There seems to be so much going on in a one-to-group setting that it was requested there be more time to chat one-on-one...well, here is my solution ladies! This is going to be fun! 5 Days until the 2018 Ladies Offroad Convention kicks off!! Next Saturday night we will be at the 2018 Tooele County Fair -Punishment at the Peak Demolition Derby!! 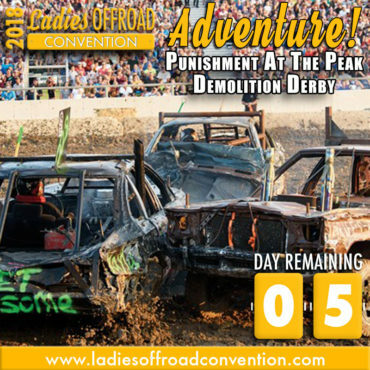 In true Ladies Offroad Network fashion, we will have a VIP experience hosted by Demolition Derby Pro Driver Queen B Racing Amy Hunter. We will meet the promoter, more drivers in the pits before the event and then join the 7000 sold out crowd as things get crazy! Can't wait! 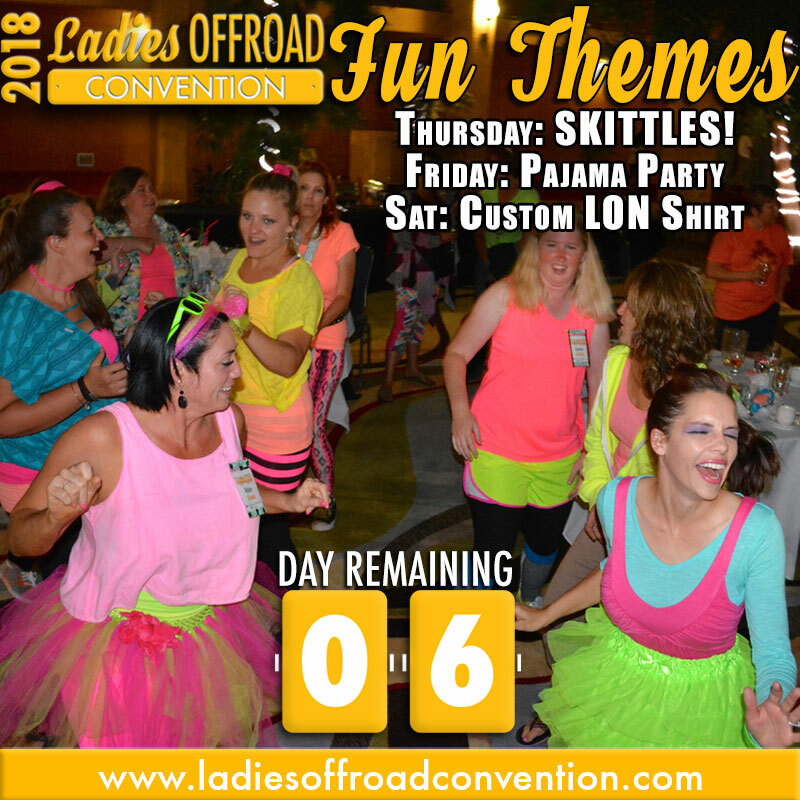 6 Days until the 2018 Ladies Offroad Convention kicks off!! Do you like to Party? Yes! Do you like to dress up? Yes! This year our evening themes will be an anticipated very colorful SKITTLES theme on Thursday Night. Friday, after a long day of seminars, ladies will get to "GO PUT ON YOUR JAMMIES's FOR DINNER!". (There might be a pillow fight, you never know!) Saturday we will have custom made Ladies Offroad Network shirt during the registration time on Thursday. We have Kicker Personal Audio speakers for the "BEST OF" from each night...yes, this gets serious! Stay tuned for pictures - they are bound to be amazing like this one from Colorado Springs last year on the 80's Florescent Pool Jam! 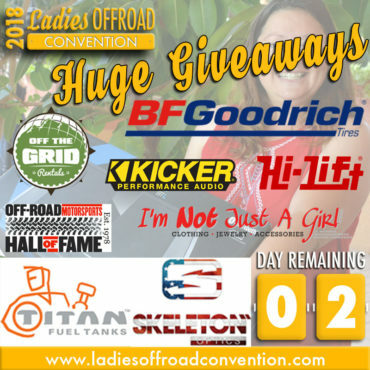 7 Days until the 2018 Ladies Offroad Convention kicks off!! Check out this lineup of Seminars and Presenters -> available across 5 sessions on Friday! 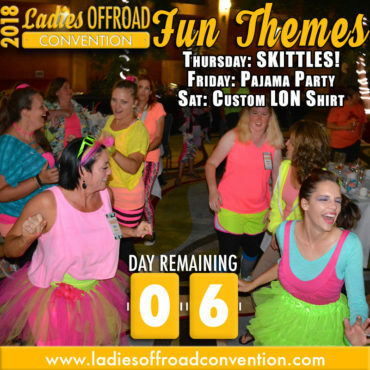 8 Days until the 2018 Ladies Offroad Convention kicks off!! What an amazing group of KEYNOTE SPEAKERS you will get to hear from at this year's Convention! --> Sue Mead, International Recognized Journalist, Racer and Offroad Enthusiast. Off-Road Motorsports Hall of Fame Inductee. She has been offroading in 36+ countries. 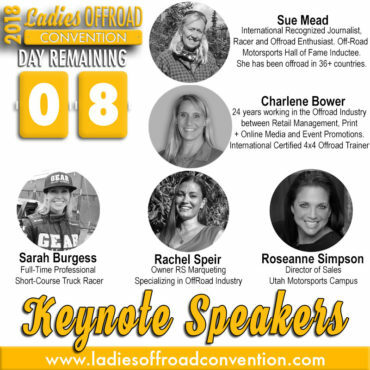 9 Days until the 2018 Ladies Offroad Convention kicks off!! --> I believe we must always Giveback! 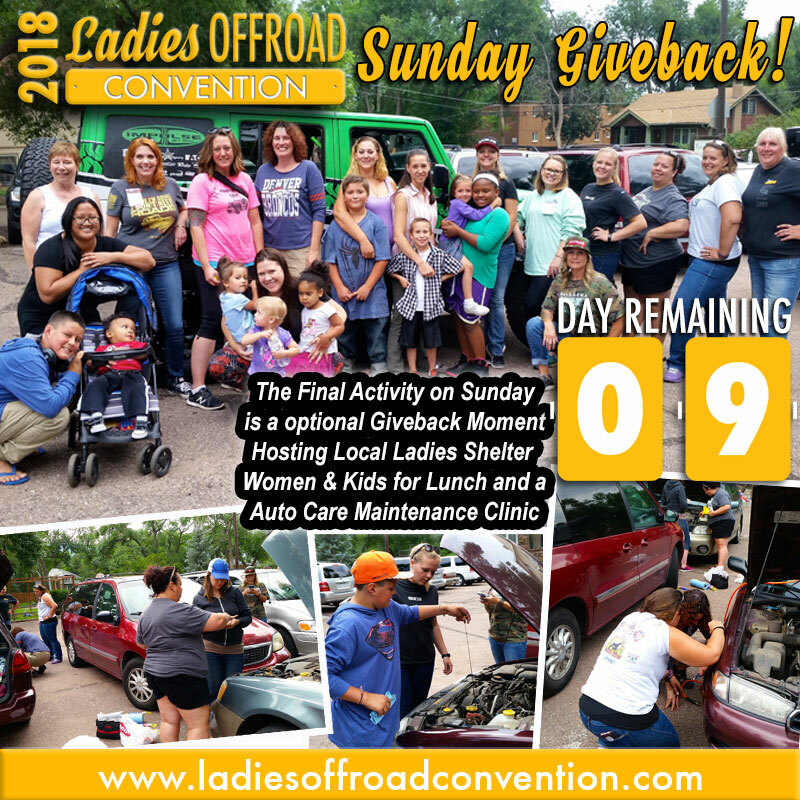 Our very last activity of the Convention on Sunday is supporting Ladies that are currently residing in a shelter with classroom and hands-on car maintenance. Some bring their cars so we are doing work right there, not just the concept of how-to. This year the ladies will also join us for lunch! -----> Want to Support? Even if you aren't coming to the Convention, we appreciate your help! Holy Cow! Only10 Days until the 2018 Ladies Offroad Convention kicks off!! Can I get a Whooooohooooooooo!!! --> One of our Adventures will be to the Utah Motorsports Campus where we will be guest of the Ford Performance Racing School. After lunch in the museum we will have professional instructors lead you through 2 different driving activities!! 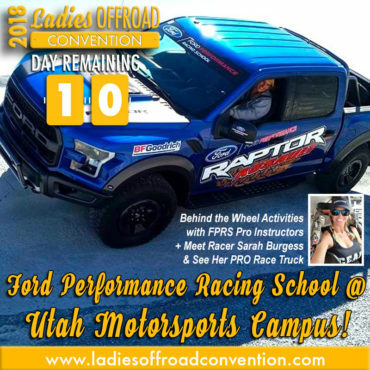 You will also have two other activities - Trail Fixes & Lucas Oil Off Road Racing Series Sarah Burgess will show you her short course truck. 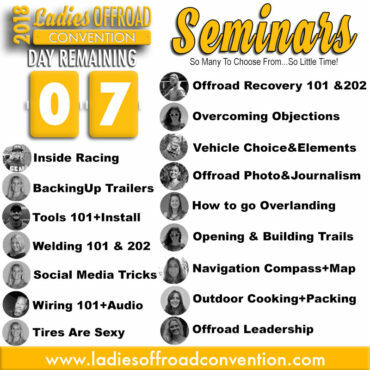 The Ladies Offroad Convention is an action-packed, interactive 4-day weekend educating, motivating, and guiding all offroad ladies. The 2018 Convention will be held in Salt Lake City, UT August 2-5, 2018. Ladies will have hands-on opportunities to learn all types of offroading skills and then we will take it inside to challenge our minds and learn from offroad ladies through their stories. 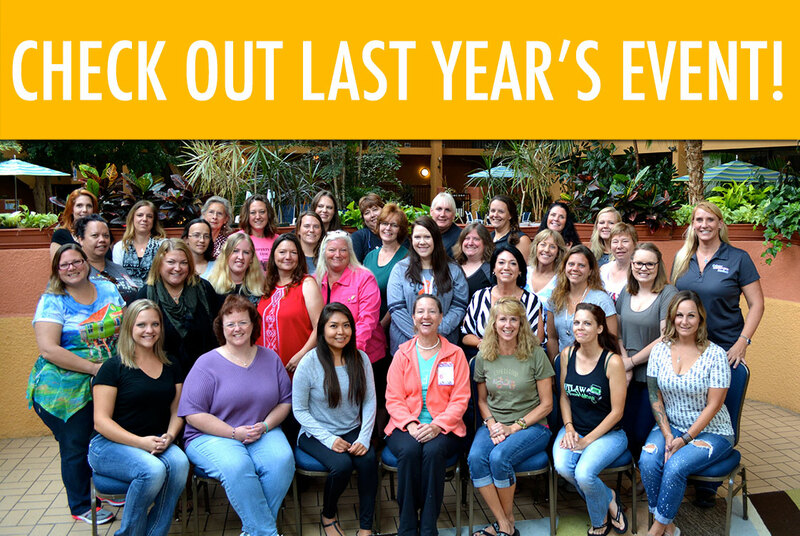 Click here to check out last year's event. LIMIT: Attendance is limited and will sell out. First 50 to pay in full will receive a special gift. PRICE INCLUDES: Two days of Instruction + Exciting Adventure + Multiple Activities & Parties + All Meals for 4 days + Transportation to & from Airports and Events. Essentially, it is an all inclusive-price. You are responsible for your travel expenses to Salt Lake City, lodging, and any additional alcohol beverages. Save Your Place non-refundable deposit of $100 is available today. Registration must be paid in full by July 31, 2018 or the opportunity will diminish as seats are filled. Click here to save your spot! Thursday we will start the activities as soon as you arrive and check-in with our welcoming staff. There will be a dozen stations set up around the conference room where you can learn something new or test your skills. Simple, fun but may also be challenging. Our vendors and partners will also have booths to stop by. Of course we will add a little competitive spirit to the afternoon, so don't plan on coming in at the last minute. 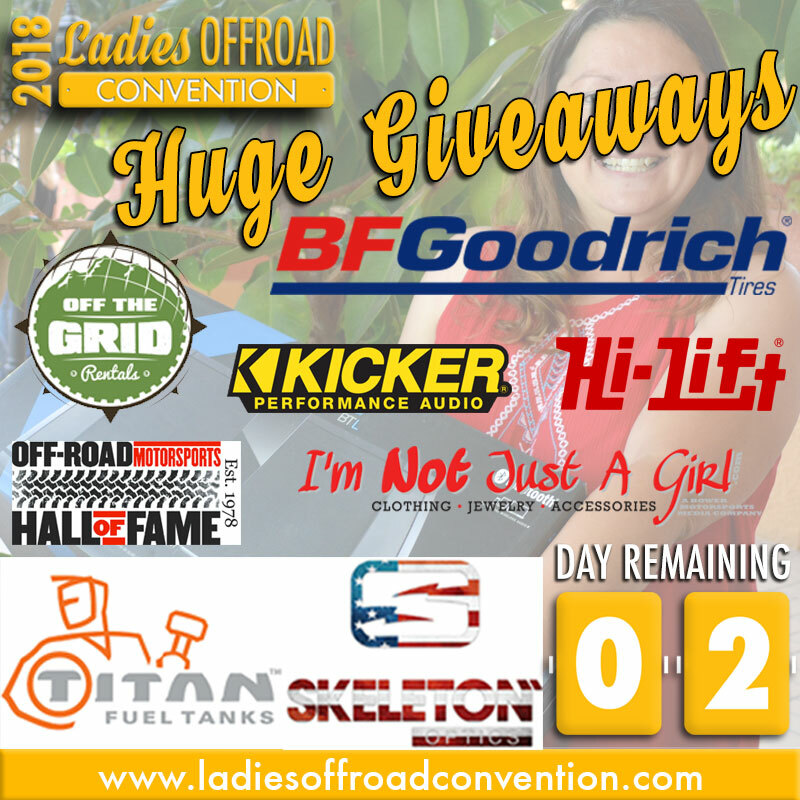 These unique stations will be ideas of, and hosted by, our 2016, 2017 and 2018 Ladies Offroad Challenge Top 10, and our Brand Ambassadors. You will get to meet and interact with ladies you have cheered on during the challenges and events throughout 2016, 2017 and 2018! On Friday, you will get the chance to choose 3 seminars of your choice in addition to one required seminar that everyone will attend. The seminars are built around various aspects of offroading. We encourage you to attend one where you feel confident in knowing most of the information and can sharpen your skills and then, step outside of your comfort zone and attend seminars that push you to try something new or attack a skill you have always wanted to learn. All of the seminars are hands-on and may be outside or inside, depending on the topic. The "Offroad Recovery & Driving" seminar will be required and will cover safety, spotting, and pulling a winch line! (Don't worry, it's actually fun!) 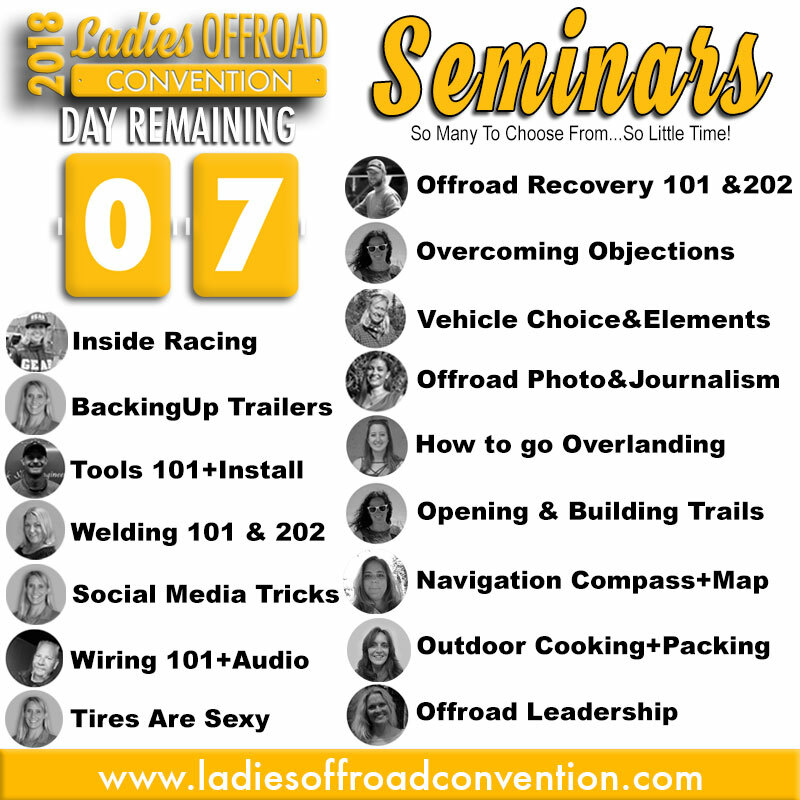 Additional seminar topics will include: "Recovery 101", "Recovery 202", "Welding 101", "Welding 202", "How to Read a Map", "Outdoor Photography", "How To Back Up a Trailer", "Racer Strategy", "Offroad Marketing for Business and Racing", "Vehicle Sympathy and Maintenance", "Navigation 101", "Offroad Business Round Table", "Kids on the Trails", "Cooking Outdoors", "Overlanding 101", and more. If you have a seminar topic that interests you, please email us for consideration. You will be able to choose your 3 seminars in order of registration. Register early to be at the front of the line! Seating for some seminars may be limited and will sell out. Salt Lake City offers a variety of outdoor activities for offroad enthusiasts. On Saturday morning we will leave the comforts of the convention center and head to the Utah Motorsports Campus that is a auto, offroad, motorcycle, bicycle and kart racing facility that has multiple tracks including a dirt short course track used for Lucas Oil Offroad Racing and a man-made rock crawling area where W.E. Rock Rock Crawling Nationals have been held multiple times. We have a full day planned with different opportunities to try something new and step outside of your comfort zone thanks to the Ford Performance Racing School. We will be split into groups and rotate through different stations. Learning is at the base of our day, but I guarantee there will be some huge smiles as you put your hands on steering wheels and try a new technique, take a moment to understand the dynamics of the vehicle in different settings, and appreciate the museum of historical cars and trucks. Once our day is over, we will be shuttled to another location for a very special evening of dirt racing. As soon as final details are confirmed, we will release this wild adventure! We like to party! Each night we will host a themed party that will bring some entertainment and fun to the dance floor along with a fun offroading style activity. Enjoy a nice glass of wine with new friends or hop out onto the dance floor and show off your skills! Lady Racers, we will have a couple high-level racers that you can learn from. Understand more about Racer Marketing and Strategy, what racing is off the track and on the track, plus network with other racers that can help with building your competitive advantages. Guaranteed to leave with a solid fan base too! All the ladies in attendance will be similar in nature to yourself. Fun, excited to learn, willing to jump outside the box, and looking to meet others. Through different activities you will get to meet and work with the whole group. We encourage you to enjoy the friend that you came with, but nurture the new friendships that you can both build. Giving back, helping others, and being kind are extremely important to Charlene. 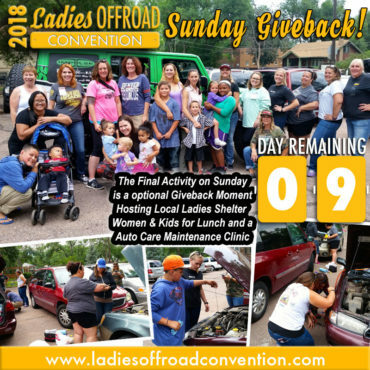 The final event of the Ladies Offroad Convention weekend will be built around helping ladies that are currently residing in a homeless shelter understand their vehicles better. Some have kids that will join us and get to see a Jeep for the first time. We will be packing backpacks with car care products, donations will be welcome - Contact us for specifics. This event is listed as an optional event to allow ladies to travel early if needed. We sincerely hope that everyone will have the opportunity to stay and participate.